Inventory We are a resale marketplace, not a box office or venue. Ticket prices may exceed face value. This site is not owned by Cross Insurance Center . 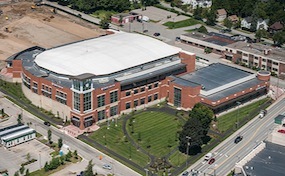 The Cross Insurance Center opened in 2013 as the new home to the University of Maine Black Bear's men and womens basketball programs.. The Cross Insurance Center box office is located at 515 Main Street in Bangor, Maine. The arena was constructed for $65 million and has a maximum seating capacity of 8,500. The Cross Insurance Center is sure to bring in many of the best performing artist to the area including tickets for James Taylor. The facility also boasts a Convention Center onsite. CenterBangor.com is a privately owned and operated company that operates exclusively in the online resale ticket market. We are not affiliated with any University, team, box office, or official website. Ticket prices on our sites are often above face value and can change quickly with the market conditions. To order tickets for all Cross Insurance Center Bangor events call our operators at anytime or follow the steps online through the checkout.